As much as it pains me to put this picture up as the heading for the blog post today, I have to do it because I can't deny reality. Last Thursday night, the Los Angeles Lakers defeated the Boston Celtics in Game 7 of the 2010 NBA Finals. It was one of the ugliest, strangest, tensest and hardest played games of all time. You had Kobe shooting terribly from the field. You had Ron Artest coming alive to lead the Lakers. You had Pau Gasol showing the world why he is perhaps the best low post player in the game today. You had Rondo playing erratically. Pierce playing well but not well enough. Ray Allen playing well but not well enough. Big Baby defying his own weight and the principles of gravity on several lay-ups. Rasheed Wallace shooting terribly but making a three in the fourth quarter that made you say that you always loved him as a player. Basically, Game 7 fell in line with how the rest of the series played out. It was hard to decide who the better team was. Kobe pressed too much. The defenses were spectacular. The offenses had trouble running. There was ugliness, turnovers and it bascially came down to the last quarter and who wanted to seize the moment more. On this night, it was the Lakers as the Celtics came up cold in the final quarter and could not figure out a way to run their offense and get points. Now, you may also say that terrible officiating came into it and you can throw out free throw stats. And that is always valid. Sometimes (well, very often in the NBA) the referees can take away the game from a team. However, despite my own proclivity to seek out referee conspiracy theories, in the end, a team will put itself in a position to win a game and if part of winning the game means putting yourself and your team in a position to sway the referees, then that is a part of the game of basketball. 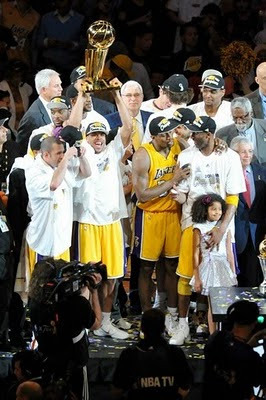 So, what do we learn from the 2010 NBA Finals if we take the Lakers victory over the Celtics in 7 Games on face value. Well, there isn't much to take. Kobe may have helped to cement his legacy as the greatest Laker ever by tying Magic Johnson for championships. However, it looked as though Kobe would wilt when the pressure was highest as he has done in the past. Kobe idolizes Michael Jordan and Michael Jordan would have never allowed himself to play that poorly in the most important game of the season. Rondo did not seize the moment as I hoped he would and we have to see how he will rebound next year knowing full well that he is and should be the leader of the Boston Celtics but will need to become a better shooter to fully wrap his mind around the psyche that is needed for that position. The only thing that we can safely say about the 2010 NBA Finals was that it featured some of the best defense from two teams in recent years and that it featured a presence of effort and urgency that is often lacking from the NBA. One of the reasons why people have grown away from the NBA is because of its high level of showmanship, the ease with which the players play the game, the perceived laziness of the players at times. Obviously the proclivity of officials to call fouls and slow down the game is unattractive to an average fan, but I think the ease and the perceived laziness of the game is also a main factor. To compound this trait, we also have an era where we have a bevy of larger than life SuperStars who tend to underachieve. Lebron James obviously has immense talent, but he underachieves. Carmelo Anthony can't get players around him who understand that he is the best player and that in order to win, they have to defer to him. Dwyane Wade has won one championship but has recently been mired with terrible teams who have no desire to win. Chris Bosh has been on terribly put-together teams and has played in obscurity in Toronto. These players have all (with the exception of Wade in 2006) lacked the opportunity to seize the moment, to show that the game of basketball is all about effort. That is not to say that each of these players and that most of the current SuperStars that are in the NBA do not play hard. These are some of the hardest working stars the NBA has had since the late 80's and early 90's. However, with the Lebron Sweepstakes and the Summer of 2010 monopolizing the headlines it is not hard to infer that sometimes these SuperStars do not fully grasp the effort that is needed to win an NBA Championship - the dedication and reliance on the team that is necessary. Now, you may say that these players do care about the effort, because they are trying to position themselves, in a rather groundbreaking and organized way for professional athletes, in the best situation for them to win and to add to the level of competition in the league. I absolutely understand that. Yet, there is that lingering desire of Lebron James to be the next billionaire athlete that disturbs me whenever I hear it. That same feeling is tied to watching Lebron laugh and joke in the middle of a playoff series where the Boston Celtics are stealing destiny right in front of him. That feeling is tied to watching Dwight Howard get outworked by the Boston Celtics in the Eastern Conference Finals and still be smiling in the fourth quarter of a game. I am not a Boston homer by any means. I have become invested in this Boston Celtics team over the past few years because I have always been a fan of Kevin Garnett and the effort that he has always dedicated to the game of basketball since he was only 17 years old. I have become a fan of the Art of Ray Allen, the likes of which I may not see for a very long time. I have also become a student of the nuanced range of skill that Paul Pierce possesses. And obviously, I am very much invested in the rise of Rajon Rondo as one of the premier players in the NBA and a genuine freak of nature. But what this Boston Celtics team has showed us over the past three years and this past year especially is the vast difference between successful and enjoyable basketball and basketball that turns people away. When the Celtics are at their peak, as they were in 2008 and through much of this 2010 Playoffs (and to a degree in the 2009 Playoffs with the grit they showed), they exhibit a brand of basketball that is completely team oriented without being bland. They have an exciting shooter; a point guard that can control the game and have an impact by not putting up huge numbers but by making big plays at the right time and filling up the stat sheet; they have a pure scorer; they have a determined defender in the low post who refuses to give in to age and reality, which can be neccessary in life (although in not such large doses); and they have a bench with whacky personalities who chomp at the bit (sometimes too much so) to play basketball. When these Celtics have been great, there has been a palpabale sense of effort, of energy, of excitement - which are the fundamental elements of good basketball. When they have been bad, like when egos and age got in the way of the majority of the 2010 season, they show all the problems of basketball: complaining, laziness, coasting on talent to try to win games and not being successful. We have seen much of the latter from the majority of the NBA in the past 15 years, but as of late we have been emerging from that medieval era. In the end of this 2010 NBA season, we had a Lakers team that woke up as well and was game for the challenge of trying hard, of playing great defense and wanting to win an NBA title. So, we had a Finals that was baffling, that was ugly and that many times did not feature one stand out player. It was a definite change from the NBA we have all seen recently, where many times the dominant player stands out and is very often not successful. And as simple as having two teams that are trying hard, that are leaving everything on the court in order to win the championship of their sport might sound, we don't often see it in a world where becoming a sports billionaire is a priorty; where being seen with Worldwide Wes and Jay-Z is what helps determine who your next head coach will be. I'm not an old fashioned guy. I understand the world and I understand Lebron James. I just really like basketball. P.S. : If you want to know about the NBA Draft. Just go to Bill Simmons. He'll help you out here.